Evidence is piling up that pollution from cars is killing our brains. A list of studies showing the negative effects of car exhaust on humans can be found HERE. Basically, by driving a car, you're slowly killing yourself and everyone around you. While most will continue to chose the convenient method of transportation and plead ignorance is bliss, there are plenty of us that will choose to ride a bicycle. 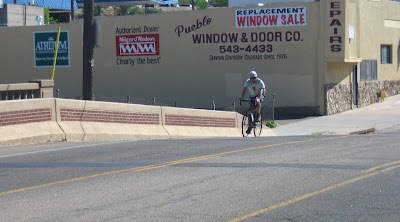 The above photo is of Ed, who about 1 year ago decided that riding a bicycle to work at CSU-Pueblo was a much better option than driving a car. Over the past 365 days, Edd chose to ride a bicycle to work every single day, rather than drive his car. Do you want to change your lifestyle? Give bicycle commuting a try for a month by joining the Pueblo Bicycle Commuter Cup. 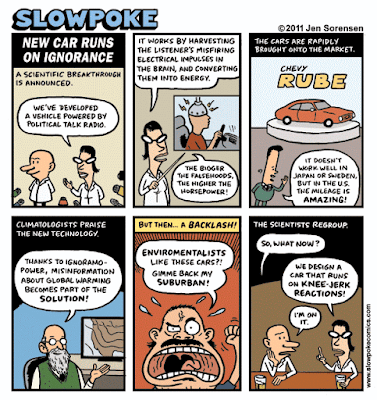 The comic below may have come up with a solution for the ignorance associated with driving a car.